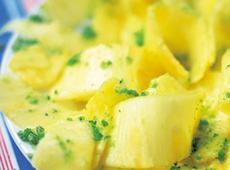 Pineapple with mint sugar...a refreshing combination of flavors! Yum. Did you actually make this? I must try to make it myself soon. Mmm. Pineapple. Mmm. Mint. Mmm. I did! It is really tasty. And fun to make with the mortar and pestle!